I got my grades for my first ever semester in college back a few weeks ago, and I'm...pretty pleased, actually. My GPA's not what it was in high school, but I'm actually okay with it. Our Chemistry professor gave us a little talk the last day of classes, warning the mostly first-year class not to panic if they saw B's or even C's on their report cards. As relatively new Oberlin students, most of us are accustomed to 4.0 GPA's, perfect scores on tests, and lots of adoration from English teachers, who loved the extra effort and creativity you use to put your vocab words into contextual sentences (please tell me I'm not the only one). Of course, we were big, innocent fish in small ponds then. I think the fact that tests, papers, and getting good grades are harder now really lets me know that I am out of high school. I actually studied this semester, which did happen in high school. I quit after five minutes both times though. A funny thing about those grades. They had been online for a whole week before I checked them. I had been wondering about how I did on finals all through Christmas and New Year's, and I even checked online the day before grades were available. I really started to get into making my bike right around that time, though, and sawing the crap out of an old steel bike pushed the thought of grades out of my mind. If I learned anything from watching the Discovery Channel, which I do like it was my job, I learned about getting priorities straight. Animals and aboriginal people really seem to know what's important, much more than us 'civilized' folk. Your needs, as told to me by a survival expert in Utah (after going without food or clean water for 24 hours, I might add) are oxygen, shelter, water, and food, in that order. If you have these comfortably, as we do (I hope you at least have these if you have internet access to read this), then you can add elements to improve your quality of life. During Winter Term, I came to realize how this can help guide me to realize what is important in my life. Grades, not that important. Food, important. Children, very important (not that I have any). Meetings, not really. God is important, if you swing that way. Getting out of the way of the water in the shower when you hear a toilet flush= most important. Winter Term is a great time to realize that learning, really, is accumulating experiences over time, not learning facts over the course of days or weeks. I hadn't taken anything mechanical apart for a really long time, and just taking a wrench and screwdriver to my old black Schwinn taught me a lot. Once I'm out of school, I doubt that I'll take another dozen tests in my life, so what good is being good at taking tests? Winter Term lets you take any subject imaginable and explore it for a whole month. Like studying spousal abuse? Slap it on a proposal and submit it. Into innuendo? Stick it in there! What I spent January working on. Impressive, no? One thing I learned not just five minutes ago: If your roommate can come into a room half an hour after you left it, and the aforementioned roommate can still smell the one that left a HALF HOUR ago, you wear entirely too much cologne. Your bike is art. How about replacing the saddle with a piece of tatami? *frantically googling tatami* yeah, that would be sweet. In research I actually found a builder who made wheels from bamboo. They were more decorative than functional, I'm afraid. 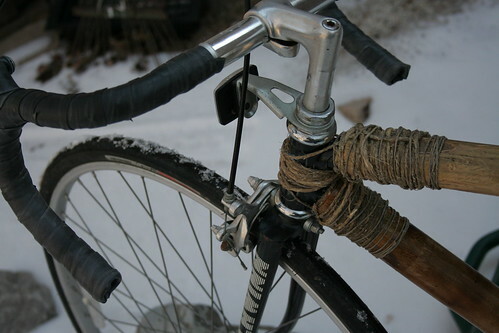 The bamboo handlebars were too small for the stem, and made the whole thing entirely too dangerous to ride. I added a second picture to the post to show how the front looked after some modification. Those are standard handlebars wrapped in an old inner tube. I really tried to recycle stuff as much as I could.